SSAB Europe will carry out repairs and maintenance work at one of the two blast furnaces at the Raahe site in Finland. This means that the operations at blast furnace 2 will be stopped for around 8 weeks and the total cost is estimated to be around SEK 200 million in the first quarter of 2019. The background is the minor break out in blast furnace 2 that occurred on January 22, when some molten iron leaked through the hearth wall from a hole. The blast furnace was stopped temporarily and repair work started. In addition, an extensive analysis of the condition of the blast furnace was initiated. The conclusion from the analysis is now that, aside of the repairs, maintenance work planned for the summer of 2020 will be brought forward to reduce the risk of further disruptions. This means that the operations at blast furnace 2 will be stopped for around 8 weeks in total. The production loss will partly be compensated by the other blast furnaces of SSAB Europe and by the blast furnaces of SSAB Special Steels in Oxelösund. SSAB Europe also has the possibility to source external slabs. 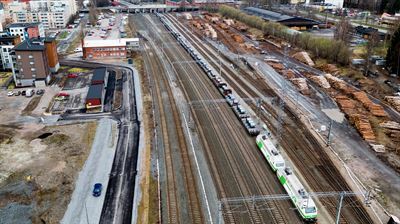 The negative result effects are mainly lower capacity utilization and increased cost for logistics and repairs, which is estimated to be around SEK 200 million in total in the first quarter of 2019. As the production loss partly will be compensated, the impact on shipments during the first quarter will be limited. The maintenance work being done will mean that the refurbishment of blast furnace 2, scheduled for the summer of 2020, will be postponed until 2022 or 2023. The production at blast furnace 1 in Raahe is running according to plan. This information is inside information that SSAB AB (publ) is obliged to make public pursuant to the EU Market Abuse Regulation. The information was submitted for publication, through the agency of the contact person set out above, at 2.15pm CET on February 4, 2019.